Enjoy a Day of Family Fun Near Washington, D.C. The Arlington County Fair is a summer family event complete with carnival rides, live animal shows, musical entertainment, arts and craft exhibits, and a variety of international foods at the fairgrounds at the Thomas Jefferson Community Center in Arlington, VA. Here, local crafters will display items such as needlework & apparel, dolls, photography, creative writing, flowers arrangements, and ceramics, and on Saturday, there will be a parade to the fair starting outside the Arlington Career Center, proceeding along South Highland to 2nd Street South, then finishing at the fairground. New and highly successful in 2017, you’ll have even more culinary delights to choose from with an expanded array of food trucks. There will also be a "Photo of the Day" Contest and a “Find the Disco Ball” contest (a tribute to the Fair’s 1977 birth) with prizes for the winners. Dates this year run from Wednesday, August 15 through Sunday, August 19, and admission to the fair is free. Be sure to check the official website for more information on performances, schedule, and where to park. The Arlington County Fair is one of the largest in the region, which means there's a lot to see and do on your visit. From racing piglets to the Harlem Wizards, this popular annual event has everything you'd want at a county fair. The air-conditioned indoor exhibitor hall features an interactive aquarium area, indoor community entertainment, arts and crafts making, jewelry vendors, competitive exhibits, and a separate area for community and commercial exhibitors. Outside, the Cole Amusement Midway sets up a number of kiddie and thrill rides, games, and pony rides including Catch N Air, Cliff Hanger, Rainforest Expo Wheel, Funnel Force, Hurricane, Super Shot, Tilt A Whirl, Zipper, Money Maze, Dizzy Dragons, Go Gator, Jolly Choo Choo, Jungle Crawl, Magic Carpet Slide, Skipper the Dolphin, and Willie the Whale. The outdoor fun begins with the 5 p.m. ribbon-cutting on Wednesday in front of the Thomas Jefferson Community Center where there will be pony rides, a True Health Kids Obstacle Course, and animal races. The following days will feature free musical performances, the Harlem Wizards, dancers, and other special exhibitions. There is no public parking at the Fair and parking on nearby streets is restricted to neighborhood residents with temporary permits. The community center parking lot will be used for fair vendors and exhibitors only. Shuttles will run continuously from the Ballston and Pentagon City Metro station, and from the I-66 parking garage and Arlington Career Center lot for a small round-trip fee (children under 12 may ride for free). Bike Arlington and partner Two Wheel Valet usually team up to provide free valet bike parking on the tennis courts. Although not yet announced for this year, typical participants in the fair include the U.S. Army Color Guard, Old Guard Fife and Drum Corps, Arlington Combined Honor Guard, Arlington County officials, members of the Arlington County Fire Department, The Arlington Players, Audi Arlington, Bike Arlington / WalkArlington / Arlington PALS, the Civic Association, Fraternidad Cultural Pachamama, troops from the Girl Scouts Association, students of the Merit School, members of Mothers of North Arlington, Sultanas Troupe, and many more. 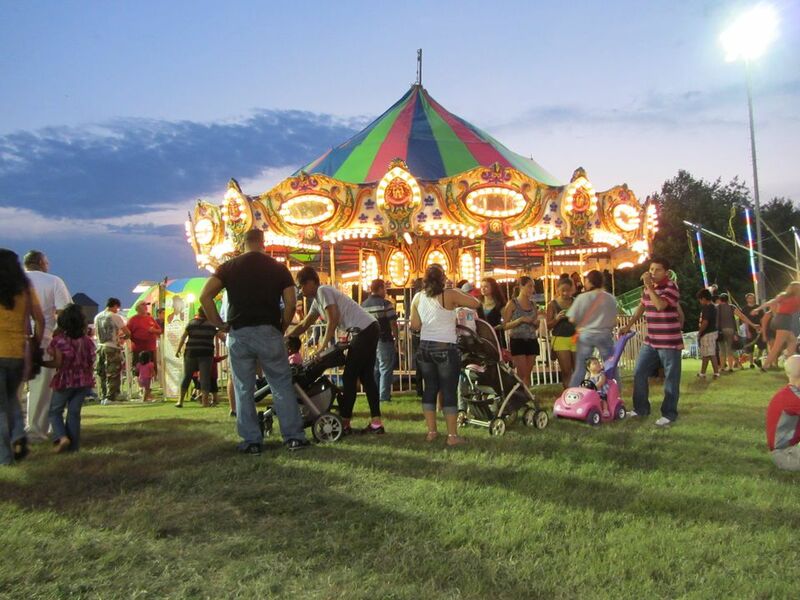 The Washington, D.C. area hosts a wide variety of community fairs throughout the summer; be sure to check out our guide "Maryland and Virginia County Fairs" for more information on these other exciting events.